Do you have a Fall Protection Program for OSHA? Effective Jan 13; OSHA has increased the max fine to $126,749 (from 70k) for willful (knowing the law but ignoring it) and repeat violations. You know the law – do not remain non-compliant. Get the Fall Protection Compliance Bundle today! NEW!!! OSHA now requires you to train your crew and have a Fall Protection Program†. 1. The law applies to every VA company that works 6′ or more off the lower level. 3. You must have a custom Fall Protection Program and Fall Protection Site Plan. You only need one bundle to train all of your employees. Use our OSHA fall protection training DVD and Fall Protection Compliance Bundle to train your Crew and deploy a fall protection program, site plan, and more. Contains everything on the right! Why is this Required? Fall Protection is the #1 OSHA violation. Over 10,000 people are killed every year as a result of falls… and 200,000 to 300,000 people are disabled. 85% of all falls that occur on the job result in “lost work time”. FACT: More than $34,697,819.41 in fines were issued last year. Don’t be one of the next. Am I Responsible for Training? Not sure if you need a Fall Protection Program or the Fall Protection Compliance Bundle? If any of the conditions below apply to your company, you must meet OSHA Fall Protection rules. 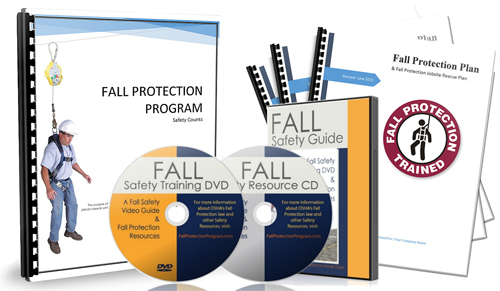 The Fall Protection Program and employee DVD are two of the 30+ items included in the Fall Protection Compliance Bundle. You/Your crew works in an articulating and/or telescoping boom lifts and bucket trucks. If your company works in any of these situations, fall arrest systems MUST be used and your employees MUST be trained on proper safety procedures. Our Fall Protection Employee Training DVD covers each required topic to ensure your employees understand the law. Use our Fall Protection Program template as your own Fall Protection Program and Fall Protection Plan for OSHA standard 1920.28 Sub-Part M.
OSHA regulation 1926.503 Fall Protection Training Program, defines the training requirements a company must provide to protect employees from fall hazards. The training program must teach employees how to recognize the hazards of falling and train them in the safe work practices to minimize these hazards. Our Fall Protection Compliance Bundle is the most affordable and convenient way to implement in-house safety training. The program features a 30-minute Fall Protection DVD video training and disc-based training materials, allowing your employees to complete training via computer, in a classroom, or on the job site. You receive nearly 50 Fall Protection resource items to ensure you and your crew are properly trained. Each of the items to the right are included in your purchase of the OSHA Fall Protection Compliance Bundle. Save time and money and know that your crew are properly trained. Get the Fall Protection Compliance Bundle. See the full list of items included in the Fall Protection Compliance Bundle on the right of the page. We take the guesswork and frustration out of OSHA Fall Protection Compliance by providing you the tools and resources you need to train your employees. The included Fall Protection Training DVD and quiz’s ensure that your employees understand fall protection safety. All files including the Fall Protection Program and Fall Protection Plan can be edited by you. Train your employees yourself and save money! Use the Fall Protection DVD or the PowerPoint presentation and notes to conduct your own training. Use the Certificates of Completion as proof that your employees have completed the required training. The Resource CD includes more than 50 fall protection resources including jobsite and equipment inspection logs that should be used for documentation. 100% Satisfaction Guarantee. Not happy with your purchase? Return it for a full refund. Nothing to lose. †If your company works in any of these situations, you must comply with OSHA Fall Protection rules and your employees MUST be trained on proper safety procedures. The Fall Protection Program (FPP) is one of the many items included in the compliance bundle. 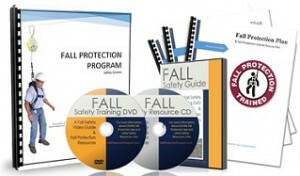 Use the included DVD to provide Fall Protection Training to your employees. The sample Fall Protection Program template is company-specific whereas the sample Fall Protection Plan template is site-specific. Need Fall Protection Safety Topics for Safety Toolbox Talks? We have those as well. Everything is included in the OSHA Fall Protection Compliance Bundle to help with OSHA fall prevention on the jobsite. Fast & Affordable – Buy Now! Fall Protection Requirements for Const. NOTE: All resources are digital files that you can edit & print as many times as needed. Other places charge $250+ for each revision/copy. †† The Spanish version of the training video, quiz, and worksheet are provided as a free bonus download to all customers. The DVD you include with the bundle makes it very easy for my guys to understand. Not to mention the money I save by training them myself using the instructions. Highly recommended!! Wasn’t sure how good this would be since the price is lower than other places but you hit it out of the park and included everything we need. Me and my men learned stuff that could have got us in trouble so thank you. I really like that I can edit the files myself since most places we looked at did not do this. The video is good and is much easier to understand than asking everyone to read. Bought from them before and it was a good experience so we got this. This was the easiest option for us to have a program and plan for each site we are on. The other stuff you include makes this worth much more money.